These quaint mountain lakes offer three beautiful ways to enjoy Yosemite’s high country. From the trailhead, keep left to the outlet of the lake. You may need to get your feet wet to cross over Tenaya Creek. Once across the creek, take a right and follow the creek downstream for a bit as it meanders through the forest. The trail leaves the creek and continues along a fairly level path through a changing mix of forest, rock formations, pocket ponds, and seasonal feeder streams. At approximately 1.5mi/2.4km, the trail begins gaining elevation with views opening up as you switchback up the steep hillside. You’ll crest the ridge through a boulder-ridden forest where the trail for Clouds Rest breaks off to the right. Stay left and begin traversing the hillside with views of Sunrise Mountain with Clouds Rest in the distance. The first lake quickly comes into view, wonderfully nestled beneath a crumbling granite hillside. The trail continues over the outlet, then up and over a ridge near the second lake containing a couple small islands. The lake is visible below, but the shoreline is only accessed by going off trail. 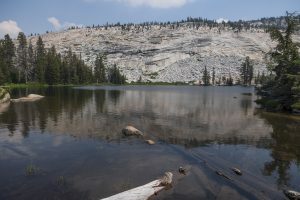 To get to the third lake, continue on the trail as it climbs up along slabs of granite to the shores of this equally beautiful lake (albeit the quietest of the three). Turn around here, or continue on another 1.5mi/2.5km up and over a ridge through a mix of forest and meadows to the Sunrise High Sierra Camp. It will add another 1,100ft/330m in elevation change, but the camp overlooks a fantastic, stream-laced meadow backdropped by the rugged summits of the High Sierra. 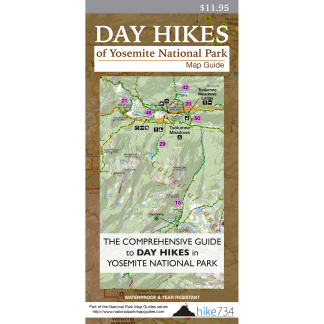 Trailhead: Look for the small, signed parking lot labeled “Sunrise” along the Tioga Road near Tenaya Lake.